Sophie’s a strange bird when it comes to order. Lately, she insists on brushing her teeth before her nap as well as before bed. Which is fine. Except that it takes f.o.r.e.v.e.r. and, if you’re not careful, often results in a meltdown. The stool has to be on the bath mat, in front of the sink. Her toothbrush and toothpaste have to be on the sink and if anything else is on the sink (aside from soap) she flips out. She has to open the toothpaste herself and she has to try to squirt out the toothpaste herself, even though she knows that for a week now it’s been almost empty and she’s not strong enough to get the remaining paste out. So then she says “a little help please,” (just like that … I would love to know where she learned that phrase), which is my cue to take the toothpaste from her (but not the toothbrush! ), and squirt it out for her, while she holds the toothbrush just so. Then I put the toothpaste back on the sink (but I don’t dare put the cap on) and she brushes her teeth, sans water. Then she puts her toothbrush down and puts the lid back on the toothpaste. Then she picks her toothbrush back up and turns the water on. She dips the brush in and out of the water, and in and out of her mouth, until I insist we end this ridiculously long process and go to nap/bed. She says “one more time,” and then she (and only she) turns off the water. She reminds me not to put anything else on the sink and that she wants to be the first one to leave the bathroom. We go through this, twice a day. Often, with two 7-month-olds screaming downstairs. And if the smallest, most insignificant thing happens out of order, tears ensue, for at least five minutes. People tell me there’s nothing abnormal about this—she’s 2. Seriously? 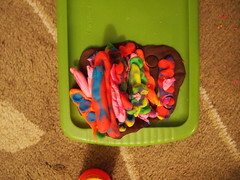 But then we play Play-Doh. And although she can be bossy with the colors, demanding I use brown even though I want pink (we’re working on that), she could care less about order. In fact, she insists we mix and match and mush the colors together together, creating eyes and spots and dots for snakes (the only thing I’m good at making). And so we do. Perhaps I should tape a photo of one of her Play-Doh creations to the bathroom mirror. Maybe, just maybe, I might worry a little less. This entry was written by kara, posted on December 22, 2010 at 11:10 pm, filed under All. Bookmark the permalink. Follow any comments here with the RSS feed for this post. Post a comment or leave a trackback: Trackback URL.